You can choose which mode Back in Time should use to store snapshots. Local snapshots can be stored on internal or external hard-drive or on mounted shares. The destination file-system must support hard-links. Also the protocol used to mount the remote share must support hard-links and symlinks. By default Samba (SMB/CIFS) servers doesn’t support symlinks (can be activated with follow symlinks = yes and wide links = yes in /etc/samba/smb.conf). sshfs mounted shares doesn’t support hard-links. Choose the destination path for snapshots with the Folder button (to show hidden files use CTRL + H or context menu with right mouse button). Back in Time will create sub-folders backintime/<HOST>/<USER>/<PROFILE>/ inside that folder. 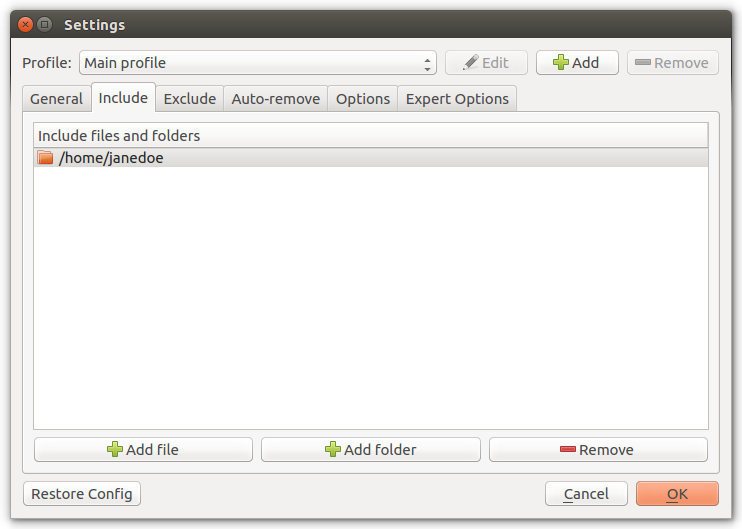 Snapshots will be placed inside the <PROFILE>/ folder. 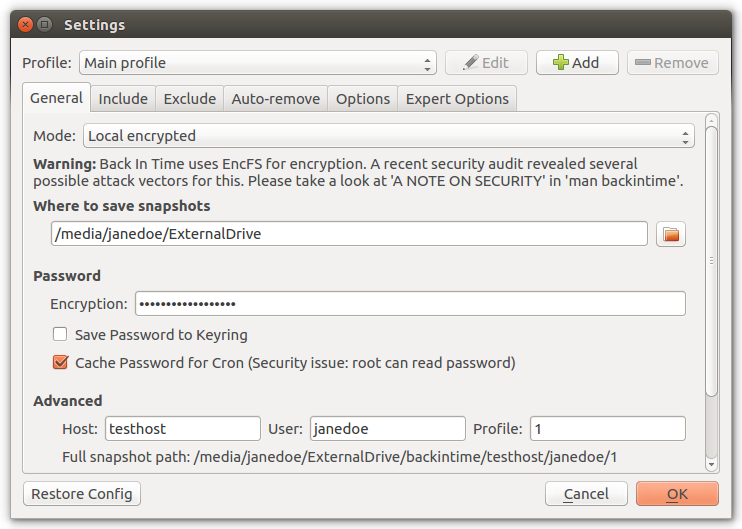 Local Encrypted works like Local but the snapshots will be stored encrypted with EncFs. The encrypted folder will be created automatically inside the selected folder. Warning: A recent security audit revealed several possible attack vectors for EncFs. Enter the password for EncFs in Encryption. The password can be stored in users keyring. The keyring is unlocked with the users password during login. When running a scheduled backup-job while the user is not logged in the keyring is not available. For this case, the password can be cached in memory by Back in Time . 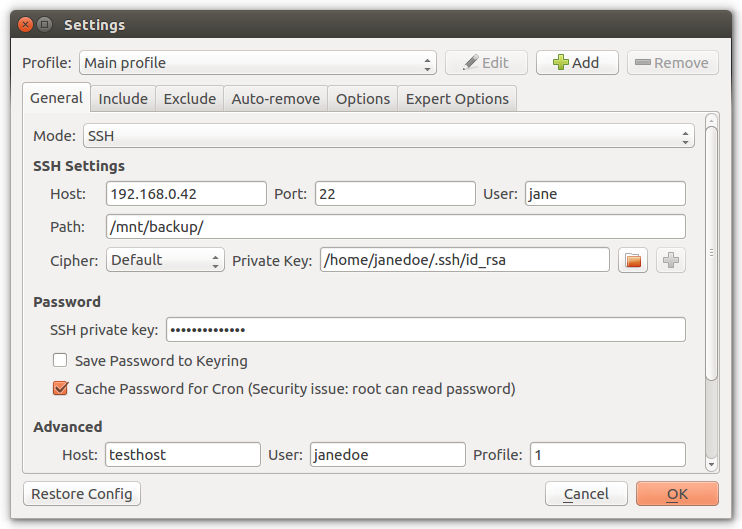 This mode will store snapshots on a remote host which is available through SSH. It will run rsync directly on the remote host which makes it a lot faster than syncing to a local mounted share. if you did not login into the remote host before you need to run ssh USER@HOST in Terminal. You will be asked to confirm the fingerprint of the remote host-key with yes. In order to compare the host-key you need to login to the remote host locally and run ssh-keygen -l -f /etc/ssh/ssh_host_ecdsa_key.pub. The fingerprint from this output must match the fingerprint you got asked above. You can exit immediately after this. generate a new public/private SSH key with ssh-keygen. Press Enter to accept the default path and enter a password for the new key (this has nothing to do with your user-password on the remote host). run ssh-copy-id -i ~/.ssh/id_rsa.pub USER@HOST to install the newly created key on the remote host. For the last time you need to enter the login password for the remote user. If successful you should now be able to log in without being asked for your login password. Enter the name or IP-address of the remote host in Host and the port of the remote SSH-server in Port (default 22). User need to be the remote user. Path can be empty to place the snapshot folder directly into remote users home folder. Relative paths without leading slash (foo/bar/) will be sub-folders of users home. Paths with leading slash (/mnt/foo/bar/) will be absolute. In Cipher you can choose the cipher (algorithm used to encrypt) for SSH transfer. Depending on the involved systems it could be faster to select a different cipher than default. Some of them might not work because they are known to be insecure. You can run backintime benchmark-cipher to compare transfer speed of all ciphers. Enter the private key password in SSH private key (this is the password you chose above during creating the public/private key pair, not the login password for the remote user). The password can be stored in users keyring. The keyring is unlocked with the users password during login. When running a scheduled backup-job while the user is not logged in, the keyring is not available. For this case, the password can be cached in memory by Back in Time . 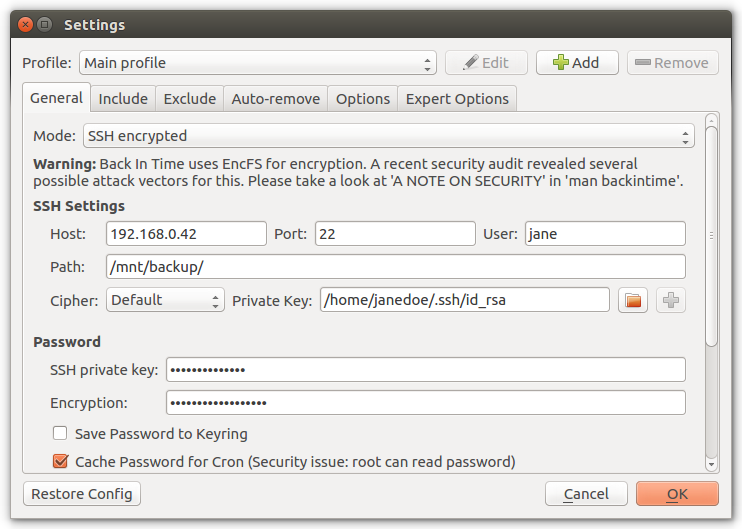 SSH Encrypted will work like SSH but the snapshots will be stored encrypted using encfs --reverse. Back in Time will mount an encrypted view of the local root file-system (/) and sync it with rsync to the remote host. As Back in Time will backup the encrypted files, all logs and status messages will show cypher text. Additional to those settings from SSH you need to provide a password for encryption. Host, User and Profile will be filled automatically (must not be empty). They are used for the snapshot path backintime/<HOST>/<USER>/<PROFILE>/. The full snapshot path will be shown below. You can change them to match paths from other machines. You can choose between couple different schedules which will automatically start a new snapshot. Most of them will use crontab to set up new schedules. You can use crontab -l to view them or crontab -e to edit. At every boot/reboot: start a new snapshot immediately after startup. This will add a @reboot <COMMAND> line in crontab. Wake up from suspend/hibernate will not trigger this schedule. Every X minutes: start a new snapshot every 5, 10 or 30 minutes. This will add a line */<X> * * * * <COMMAND> in crontab. Every hour: start a new snapshot on every full hour. This will add a line 0 * * * * <COMMAND> in crontab. Every X hours: start a new snapshot every 2, 4, 6 or 12 hours at the full hour (e.g. at 0:00 , 6:00 , 12:00 and 18:00 with schedule Every 6 hours ). This will add a line 0 */<X> * * * <COMMAND> in crontab. If the computer is not running at scheduled time there will be no new snapshot. This will not resume after switching on again. Custom Hours: define custom pattern for crontab. This can be either a comma separated list of hours (e.g 0,10,13,15,17,20,23 ) or */<X> (e.g. */3 ) for periodic schedules. This will add a line 0 0,10,13,15,17,20,23 * * * <COMMAND> in crontab. If the computer is not running at scheduled time there will be no new snapshot. This will not resume after switching on again. Every Day: start a new snapshot on a configurable time on every day. If the computer is not running at the configured time there will be no new snapshot for the day. Repeatedly (anacron): this schedule will start new snapshots after a configurable time (hours, days or weeks) when the last snapshot was done before this delay. This will also work when the system was powered off. It does imitate anacron but doesn’t use it. Instead Back in Time writes it’s own time-stamp after each successful snapshot and add a crontab job which will start Back in Time every 15min (or every hour if configured for weeks). If the configured delay is not done yet it will just exit immediately. If an error occurred during taking the snapshot it won’t write a new time-stamp and so will try again after 15min/one hour. When drive get connected (udev): this schedule will start a new snapshot as soon as the USB/eSATA/Firewire drive get connected. You can configure a delay (hours, days or weeks like in schedule Repeatedly ) so it won’t start on every new connection. This will add a new udev rule in /etc/udev/rules.d/99-backintime-<USER>.rules using the partitions UUID. 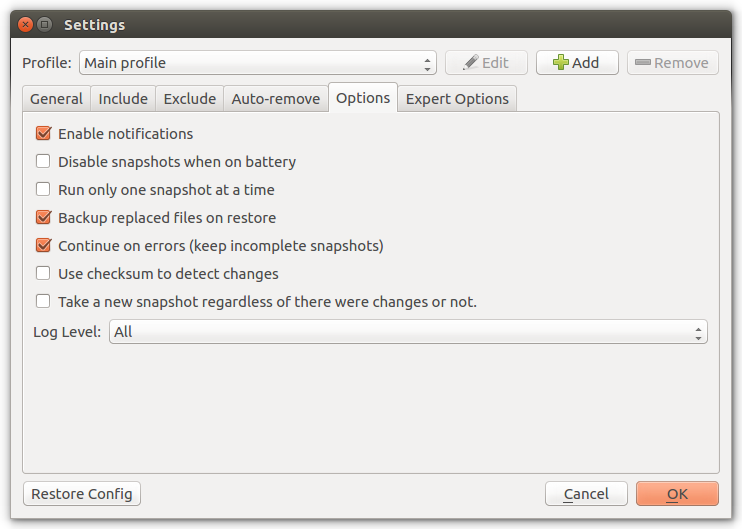 If using KDE you need to enable auto-mount for the device in System-Settings. Every Week: start a new snapshot on a configurable week-day/time every week. If the computer is not running at the configured time there will be no new snapshot for the week. 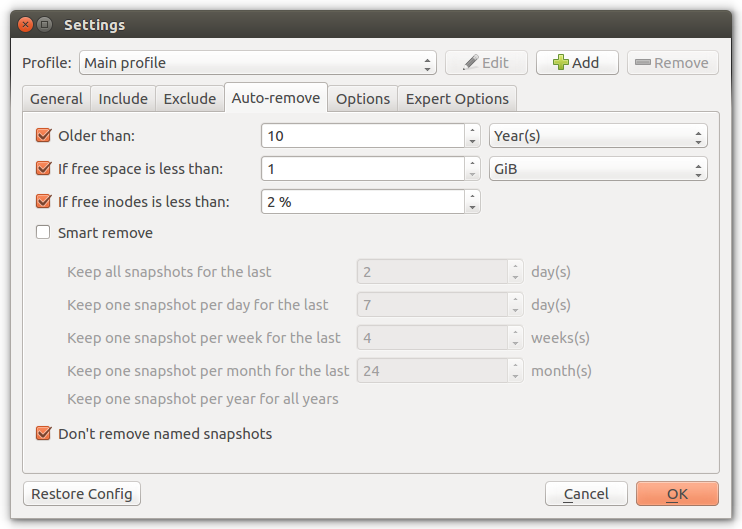 Every Month: start a new snapshot on a configurable day/time every month. If the computer is not running at the configured time there will be no new snapshot for the month.